Alsco is proud to be an active supporter in our local communities. We support a wide range of non-for-profit, sporting and local community organisations and initiatives. This is also in conjunction with our three key sponsorship initiatives for Medical Aid Abroad, Auckland City Mission and the Westpac Rescue Helicopter. Step 1: Like our Facebook page to learn more about our community involvement. Step 2: Review the list of sponsorsed organisations to check that your organisation is not already on the list. Step 3: Read the Partnership Guidelines to ensure you can offer a two-way relationship. Our goal is to not only assist you, but to also connect everyone together. Step 4: Reach out via our Contact page and tell us why the local community needs you. We welcome your feedback and brilliant new ways that we can help in our community. 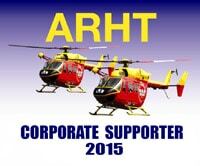 Alsco are proud to support the Westpac Rescue Helicopter with a regular annual donation for over the past 10 years. Formed in 1990 a Charitable Trust was formed with Trustees selected from the community and business sectors of the greater Auckland region. The primary aim of the Trust is to provide and develop a highly efficient aero medical service for the benefit of the community at large. The Auckland based Westpac Rescue Helicopter is staffed full-time by a highly experienced flight crew consisting of pilots, paramedics and crewmen, and operates 24 hours a day, 7 days a week, 365 days a year. 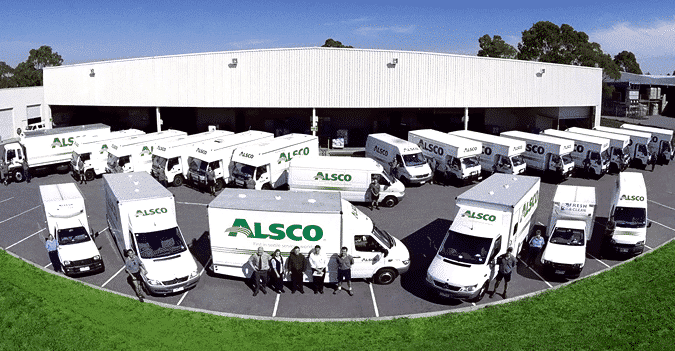 Alsco contribute both financially and with our time monthly throughout the year. Employees from Alsco Support Centre in Ellerslie and our Auckland branch in Kingsland volunteer for a day each month at the City Mission. We are helping with a wide range of activities that goes on behind the scenes every day to keep this large community organisation working. This has included cleaning, sorting of donated clothing, general housekeeping duties and of course the cleaning of dishes from the greatly appreciated meals provided each day. Medical Aid Abroad NZ (MAANZ) tell us our linen and “expired” first aid supplies are in great demand in those poorer nations who have no or little funds for medical services and supplies. Run totally by volunteers (the majority are former health professionals), MAANZ receives surplus drugs, equipment, and supplies to sort and store before sending overseas. In September 2015 alone Alsco have donated over eight pallets of goods to MAA destined for many worthy causes, mainly in the Pacific Islands such as Fiji, Samoa, Papua New Guinea, Vanuatu, and the Solomons, and even to Cambodia and Korea recently. Alsco is pleased to be one of NZPF level silver Business Partners. Established in 1982, The New Zealand Principals’ Federation represents approximately 2000 principals from education sector. This federation aims to provide support and be the member’s professional voice throughout New Zealand. Professional resources, information, as well as a number of publications and a helpline are available to members. 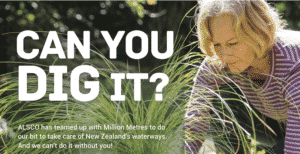 The Million Metres Streams Project is the result of discussions with people, businesses and organisations across the country who have committed to work together to accelerate the riparian restoration activity in NZ by injecting a new stream of resource. The core idea was this : to make it easy and exciting to invest in the health of our waterways – to open it up to everyone in New Zealand – people and businesses wanting to do good. Now we invite you all to take part, to fund your metre (or more) of streambank and be part of this national story of how New Zealanders collectively took action to protect something that was important to them, and together, succeeded. After all, what’s more valuable than our water? Planting a million metres of riparian margins isn’t the whole solution to our freshwater crisis, but it’s a significant step forward. And it’s something you can do right now. It is estimated that more than 90,000 people in New Zealand play or try squash each year in more than 300 clubs and other facilities with squash courts around the country. At the heart of everything Squash New Zealand do is their unrelenting drive to get more people on court more often, to succeed on the world stage and to help squash communities thrive. 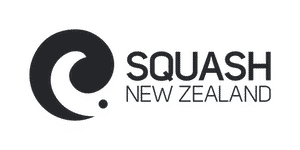 Squash NZ provide a range of services associated with the game including managing the Grading List, coordinating New Zealand representative teams, overseeing the calendar of events and providing growth and support initiatives for the benefit of the community. An exciting project to enhance an area of unused open space on New North Road is off to a flying start. The artists chose two Putangitangi ducks moving forward in unity to symbolise the lifelong partnership between Maori and European. Africa Purpose Team, a group of New Zealand doctors working in remote parts of Tanzania. East Timor Leste Trust, Kiwis on Atauto Island teaching the locals basic hygiene and first aid. Christian Leadership Training Trust, helping medical outreaches in remote villages on the island of Vanua Levu, Fiji. Christian and Missionary Alliance of NZ, short-term missions to Tonga supporting locals and Mango Tree Respite Center providing care handicapped children and their families.